I thought I’d share a few of the lovely things I got for Christmas with you. 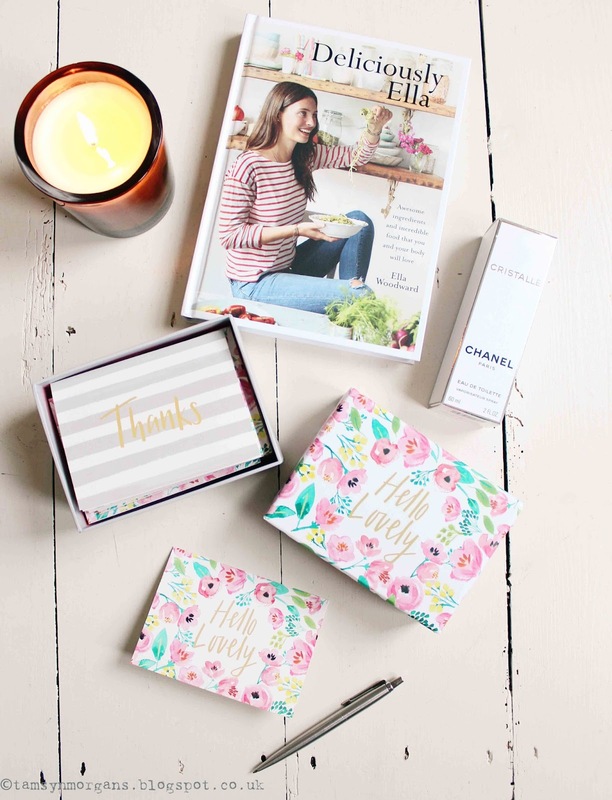 I must admit, with the exception of the gorgeous candle which my dear friend Lucy gave me (along with some amazing French soaps – I will share those with you on another post) I actually bought these gifts for myself. Well why not? A gal deserves some pretty things at Christmas! A trip to TKMaxx resulted in me putting the Deliciously Ella cookbook in my basket. I’ve seen a lot of people saying how wonderful this book is, and although I’m not going to attempt to try a vegan lifestyle at this point in my life, I love the idea of clean, nutritious food. And this book is so beautifully presented, I decided to give it a go. I also put these cute thank you notes in my baskets. It’s a shame to forget the art of letter writing, and pretty notelets are so good to have. Black Friday meant a bit of a discount at the Debenhams beauty counter, so I treated myself to some Crystalle, a Chanel scent I used to wear donkeys years ago which is an absolute classic, as well as being one of Chanel’s lesser known fragrances. It’s a scent which makes me feel terribly grown up and sophisticated, it’s gorgeous. I got given some beautiful vintage goodies through my Secret Santa at work, which I will share with you too very soon.